Salvation And Survival: Where Are You On The Chess Board? Where Are You On The Chess Board? This post is the result of a conversation between my husband and myself. You need to understand that Peace-Loving Warrior is a pretty deep thinker and often surprises me with his analogies. We spend lots of time in discussion; talking about the news of the day, or some theological point of debate, or simply sharing our thoughts for our future. So, last night we were discussing how difficult it is for all of us to face our fears. Like many husbands, I suppose, his fear is that he cannot protect me or provide for me during whatever our shaky future might bring. We agreed that these times in which we are living are causing everyone to be confronted by their fears, whether they want to be or not. And then he gave me this picture that I thought was worthy to pass on to you: "Everyone is being moved on a chess board to where God wants them. He is moving us out of our comfortable, safe systems to where we're an outlier, and we don't have any support system BUT God." In case you aren't familiar with the term outlier, it means "a person (or thing) situated away, or detached from, the main body or system." And it is a term that we Americans do not easily embrace. We are comfortable being a part of the system, where we can hide our insecurities and worries in the midst of the group dynamics. That is especially true of American Christians. How many of us have sat in churches for ten, fifteen, twenty years --- maybe even your whole life! --- and are now feeling the Holy Spirit reveal that our God is much bigger than we were led to believe? That there is much more about Himself that He wants us to know? That understandably leads to all kinds of emotions ... anger, betrayal, self-doubt, and fear. But do you recognize that perhaps it might be God waking you up to a new, and better, reality of who He is? That He is moving you out of that comfort zone for a reason? If I may, let me take you back to PLW's Chess analogy. I was astounded when I researched the rules and objectives of the game of Chess. There are two parts of the Chess-playing process: 1) setting and achieving long-term positioning advantages during the game, and 2) tactics, which concentrate on immediate maneuvers. 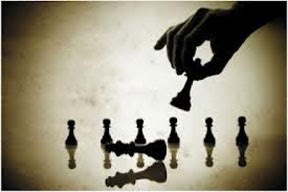 Another way to look at it is Chess strategy is concerned with evaluation of Chess positions and with setting up goals and long-term plans for the future play. That is exactly what God is doing in His "Plan for the Ages." His goal is to ultimately protect the King (Jesus), and he evaluates and moves the other pieces on the board in accordance with achieving that goal. It should be an honor to be examined and found worthy of advancing the game! Yes, we are the Pawns, the weakest and least mobile of all the pieces on the board. Throughout the game, it is the Pawns that are most easily captured and removed from the game. But I found it extremely insightful to find, written within the "Strategy and Tactics" portion of the official Chess instructions, this tidbit of wisdom: At the end of the game, when most of the pieces are gone, Kings typically take a more active part in the struggle, and Pawn promotion is often decisive in determining the outcome. What is "Pawn Promotion"? In short, it is the advancement or elevation of a Pawn to a prominent position that has an effect on the endgame. And it usually happens at the point in the Chess match when there are very few pieces left on the board. Can you see how PLW's comparison has some validity? God is moving us where He wants us, and I absolutely believe that He is moving us into positions of spiritual power to effect the results of the Game. And as we find ourselves removed from our comfortable systems, we may feel as though we are the lone Pawn on the board. But remember that God has placed you there and He is taking a more active part in your life. He is "promoting" you to become a part of His system. Is it scary to find yourself being moved into a new position? You bet it is! But you have two choices. You can either retreat into the cocoon of your safe system (whether it be your church, your family, or the recesses of your mind) and fail to take advantage of the opportunity; OR you can accept your "promotion" and take it one step at a time and let God lead you towards new heights that will glorify Him. Believe me, His system is restful, secure and trustworthy. Don't be afraid to embrace that move! Psalm 143:10 "Teach me to do your will, for you are my God! Let your good Spirit lead me on level ground!"